I was about six weeks into my student teaching experience. Twelfth grade U.S. Government, so most of my students were either already eighteen years old or almost there. As class began, we paused for our daily viewing of Channel One. I don’t know if Channel One is still around or not, but if you’re not familiar with it, sometime in the 1990’s schools could subscribe to this service. In exchange for wiring each classroom and providing a television, schools would broadcast a short “news” program each day that students had to watch. That’s just set-up, here’s the story. At the end of the broadcast on February 29, 1996, the hosts of the show gave an on camera “shout out” to a friend on his birthday. They said that it was a special birthday because even though he’s sixteen years old, this was just his fourth birthday. I was happy at least that the class was paying attention, but one of the student’s didn’t get it. That’s the story. Remember, eighteen years old, regular education classroom, senior in high school. I’m not poking fun or belittling this student, but sixteen years later, I still have a vivid memory of this event. At the time I remember thinking “you can’t teach that.” Leap year is simply a fact that exists. I don’t remember when, how, or why I learned it. If it hadn’t been taught in school, I would imagine that after experiencing leap year at ages 6, 10, and 14 that I would have been expecting it at age 18. I started to wonder why this student didn’t know about leap year. 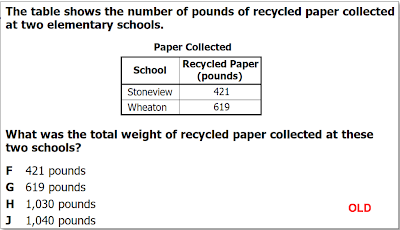 Is there a standard somewhere in the elementary school curriculum? If so, can we pin-point the right teacher to blame for his lack of knowing about leap year? If there is no standard, should we create one to make sure this sort of thing doesn’t happen in the future? 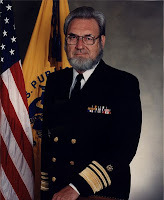 At the time, I thought this: if an 18-year old hasn’t had the natural curiosity at some point in his life to wonder why this year has more days than normal, then how can I be expected to generate enough curiosity to make this student care about the government that directs his life in so many ways. I didn’t have any problem blaming this student for his deficiency of knowledge. If he doesn’t care enough to learn, how can I be expected to teach him. I imagine that most people would find one of the preceding two paragraphs offensive—either blaming the system or blaming the student. I think both of them are flawed. When teachers blame the student for failure it becomes an excuse to give up. When politicians and ed reformers blame teachers for failure it becomes an excuse to ignore more critical problems. In either case, introducing blame sets up an adversarial system that encourages admiration of problems without moving forward into realistic solutions. Can Math Learn from History? Having written twice previously about the trials and tribulations of being a teacher of an SOL course in the posts above, I thought it appropriate to revisit the topic given some changes that occur this year. 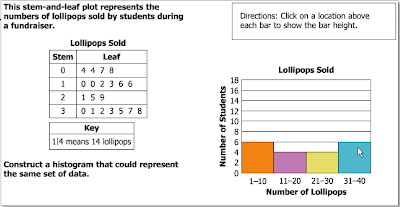 Throughout this post, I share some old and new math SOL questions with commentary for your testing pleasure. With the revision of the State Standards in Social Studies last year, our scores plummeted. To make a long story short history teachers, including myself, came out smelling really bad in our state. More than other subjects, we are hamstrung by either the inability or unwillingness of the state to make the tests more transparent(they did release a whopping 7 questions to help us out and demonstrate how things are different). I guess that's not all bad because we can't "teach to the test" as much, but it doesn't help our student's scores. Not only has the VDOE released fewer past test and test questions, they have done little to clarify or define scoring and performance practices for history in more concrete terms. It makes my job harder, hurts kids and confuses parents. What did I miss? 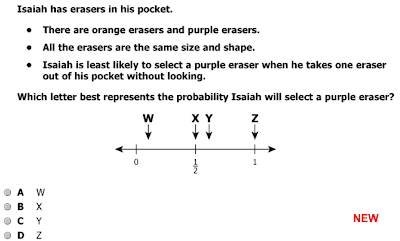 Why does Isiah have erasers in his pocket? Not much has changed since last February within our subject and there have been no obvious efforts at the state level to improve the situation from last year. 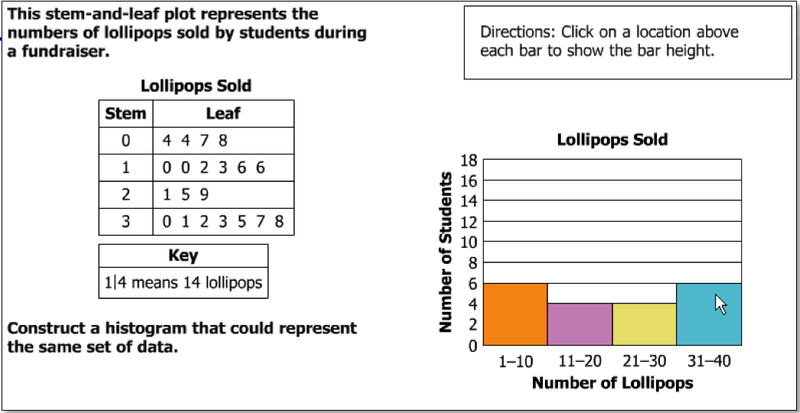 These standards and how they are measured with the corresponding Standards of Learning(SOL) tests are as much a puzzle as ever. No further developments in terms of Detailed Performance Level Descriptions to explain things to parents. Social Studies isn't even listed. As a department within our school we certainly looked at our individual results and are doing our best to adapt. This is true of every subject area but when they change the test, it is tough. Increasingly it seems no matter how hard we try or how well we do, it will be defined as not good enough. I suppose the higher ups in Richmond just figured we'll deal with this and get it figured out. I do not intentionally malign them, but at the least they are far distant from anything resembling the educational front lines. They sure don't seem to solicit or consider teacher feedback. If they did they'd be motivated to end the cat and mouse game that such high stakes testing has become. So social studies teachers are doing our best to manage. This year it is the math standards and tests that have changed. So what would I say to Virgina's math teachers... "uh oh". Math tests will measure new standards that "include technology-enhanced items that require students to demonstrate content mastery in ways that were not possible with multiple-choice tests." So these tests are harder, more rigorous and take much longer to complete. They are more wordy and for kids with poor reading skills, the climb becomes even steeper. If things play out in math like they did in social studies, it'll get rough. Math matters for AYP after all. Maybe that's why they shared some SOL Practice Items. I don't follow this stuff too closely but as score reports from first semester start to trickle out, the whispers in the woods are that things don't look good. Which brings me to my not-so-bold prediction. Math scores for the 2011-2012 cycle will encounter a precipitous drop. Not sure how that will play out but I suspect it will prove significant. Virginia's math teachers and most importantly our students will not look good. Throw in the new "college ready achievement level" on certain end-of-course tests and the table is set for kids to not feel good about how they are doing. Across the nation and in particular in VA there is an effort to develop STEM(science, technology, engineering and math) education. I wonder how these results will affect that effort. How will this play out in the media? Can we afford even more focus shifted to math at the expense of other subjects? I think back to my own high school experiences in math and can speak with certainty that more math is not always good for everyone. When I see my former math teacher walking down the hall, I still just apologize. Honest. Parents, students, the media, principles and politicians all will react differently to drops in math scores. But be certain, teachers are the ones who will need to react the most such a scenario. Such is the Value added world that came to Virginia in 2011. Will this lead to better math instruction? Or will it result in more focus on the test and prepping for it? Time will tell what the result of such an emphasis will be. I like orange Lollipops. Does that matter? In November the VDOE shared a release that indicated math scores for VA students were improving on the NAEP . 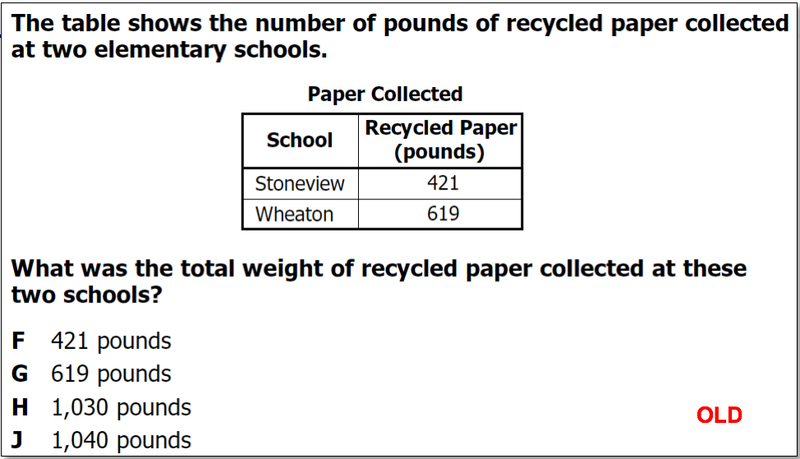 What's bad about that is that it will mean little to principals, teachers and parents when the scores start rolling in. I am glad I am not a math teacher(I've always been glad of this actually). 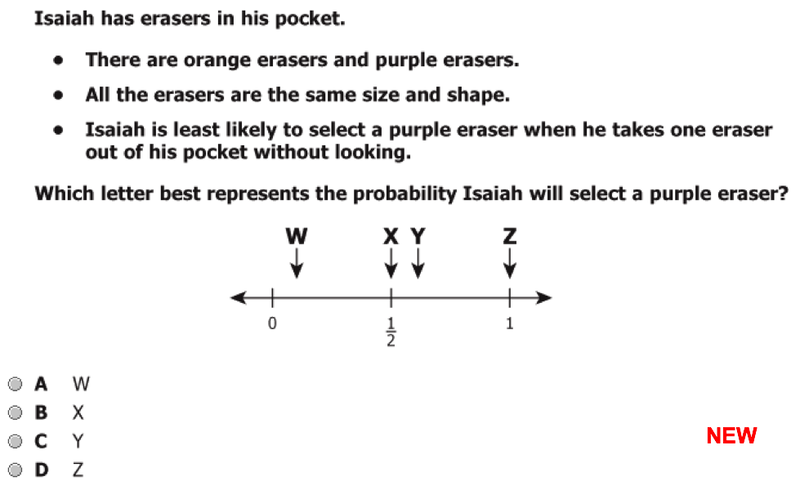 So under NCLB, AYP and Race to the Top, Math is far more important than history. It counts. But as subjects they are equal. I feel for young math teachers. The slow removal of protections of due process and tenure like those proposed this year in our General Assembly have been well documented and I think the landscape of the future for young math teachers will be especially perilous. Growth Percentiles will be skewed by the change. The letter below is an effort by one knowledgeable administrator to try and prepare parents for the questions that will certainly arise from an almost certain decline. So to my math colleagues I say, "I feel your pain." Who cares? The carnival is the same night as the Justin Bieber concert. 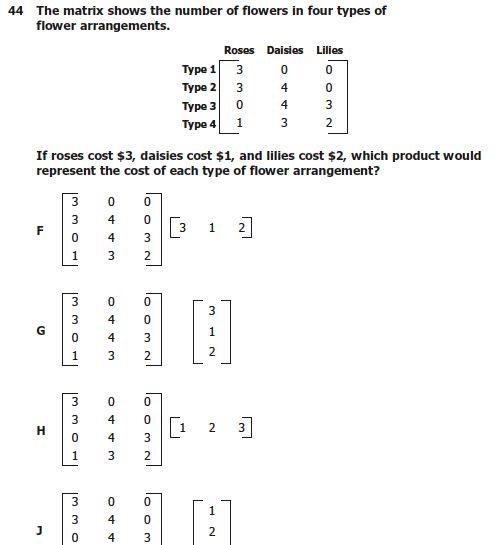 Not only do I not know the answer, but I've decided to never buy flowers again. Keanu Reeves was good in The Matrix. Action, Romance, Sci-Fi, and Musical are among the dozens of movie genres listed on the IMDB website. The TU feels compelled to argue for the inclusion of at least one more. Teacher Movies. Movies about teaching, like the profession, defy simple explanation. Yet perhaps they like no other medium convey what the job can really be like. If you watch all these simultaneously...maybe then you'd get a glimpse into the average teacher's day. In a world where teachers no longer have any allies, sometimes a movie about what you do can get you through. We are no Siskel and Ebert but we do watch a lot of movies. Ergo, we are experts. In no particular order here is the not so anticipated Teaching Underground list of definitive Teacher movies with contributor commentary included. Enjoy. 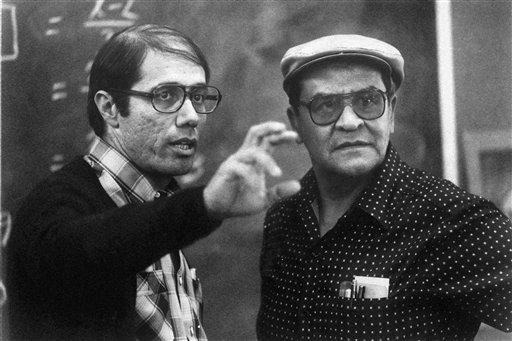 Jaime Escalante, are you serious? Could he have been more awesome? Edward James Olmos does an amazing job portraying one of the most inspiring teachers ever. I got past the comb-over and really admire that Escalante for the difference he made in kids lives. I never took Calculus but bet I could learn a great deal from him. He died last year and TU tips its cap to him and this movie. By the way Lou Diamond Philips has been in more movies than anyone, ever. I was young enough to confuse Olmos' role in this film with his role in Miami Vice. Pretty confusing. I did learn the power of expectations from this film. But we sometimes only take half of the formula from this film. The expectations alone didn't make those kids succeed. They worked hard. I like that the film emphasizes how much learning is about a relationship between students and teachers. 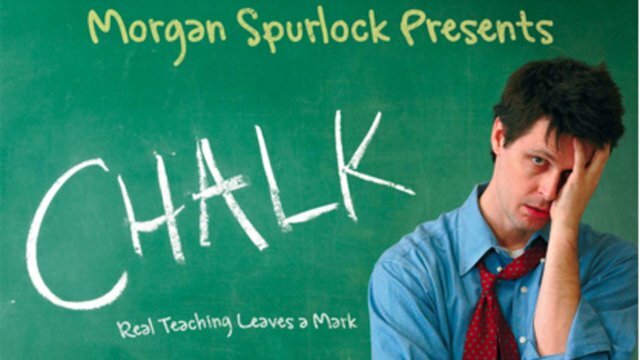 "Real Teaching Leaves a Mark" Perhaps the most unappreciated of the films on our list. Morgan Spurlock's “Office” style film was oh so close to completely nailing it. Honestly it is probably the most realistic movie. But I was left wanting a little more follow through with some of the humor in the story. But if you are a teacher, you HAVE to watch it. Ignore what offends and just laugh at the stupidity of half of what we endure. You can almost get a sense of the terror when things go south. My favorite teacher movie! I completely relate to the first year teacher in this film. Perhaps my only criticism of the movie would be that they had to plant hidden cameras in my school to gain so much inside information on it. Either that or we have more similarities than we think among public schools. From what I've read, this movie was actually made by teachers on a ten thousand dollar budget. Well worth it. Morgan Freeman does what he always does. And he makes the arrogant but admirable Joe Clark jump off the screen. I am glad I don’t work for Clark. But this movie is deep. What lies beneath? State takeovers, school reform, racial and economic disparity, failing schools…it was there all along. Why didn’t I see it? Clearly I’ll have to go back and watch this one again through the lens of a teacher in today’s world. Moral of this movie: Bull Horns = Respect Oh and know your schools alma mater, or else. Morgan Freeman patrolling the halls with a baseball bat. That's all I've got to say. Now I subbed for a music teacher when I first started and it was nothing like this movie. #1 Dreyfus isn’t crazy and all band teachers have to be crazy. Certifiable. #2 Siskel and Ebert gave it two thumbs up. This film came out as I was finishing up my education and I realized at some point while watching that hey…teaching? That can be pretty amazing stuff. (I was naïve) Funny how Holland “fell” into teaching. Not sure I did either. That’s about where the similarities end. Gotta admit being a little creeped out by the whole Rowena situation and bummed when I found out Louis Russ died. Full range of emotions, I give it two thumbs in the ear. I think the value of this film is the understanding the importance of "non-academic" subjects in education. It also shows just how different the tasks of teaching are from one subject area to the next. Other than that, I've got to admit, it isn't one of my favorites. 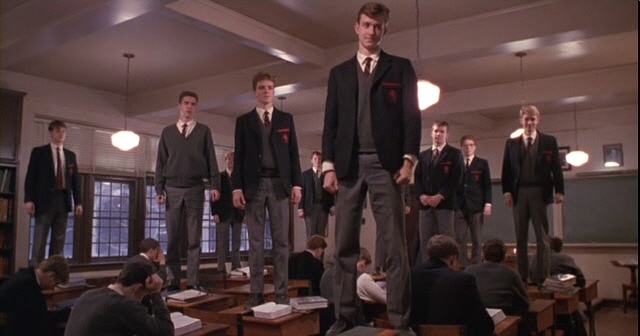 Usually I stand on my desk when I need to bang on the ceiling to get the language teachers upstairs to quiet down. But, this movie showed that education is really about growing into one's self much more than filling a brain with facts. Maybe, just maybe the most culturally significant. They just don’t seem to write characters like this anymore. Ferris, Cameron, Sloane, Mr. Rooney and everyone’s favorite Ben Stein as everyone's favorite “Economics teacher”. Required joke at some point in every class is the line “Bueller, Bueller” The experts throw in "Anyone? Anyone? Voodoo economics.” This film is about one man’s struggle to take it easy…our crafty protagonist gets through it all and beats the system and shows what can really happen when you take a day off from school. This movie is dangerous. Basically a guidebook to fool parents. It should be banned. I am glad it is not because it features my all time favorite actress Mia Sara who plays Sloane(who I maybe had a crush on then) If Mia reads maybe she’ll find my E-mail on here…just saying. I always felt bad for Cameron and not sure I really liked Ferris. Maybe I should only feel bad for Mr. Rooney? Or Charlie Sheen who really stretched himself as an actor in this one playing someone whacked out on drugs. "Save Ferris!" A parent told me just the other day that she'd given her son permission to miss a week of school to go skiing in Colorado with some friends. He's a good kid, good grades, works well with others, etc. She felt a little guilty, but I would do the same thing. Now sometimes a kid skipping school or parents letting them do it is just irresponsible. But sometimes a little break from the routine can turn into quite a life shaping experience. Just ask Ferris. This movie like that song help me escape back to a time when life wasn’t so complicated. Can a movie end any better? This is the oldest film on our list and as a pre-teen in 1985 this was one of those John Hughes’ films that potentially changed lives. Not sure how but that doesn’t matter. Anthony Michael Hall was and probably still is one of my biggest idols. At the time I am not sure I got have the humor in here but I laughed none the less. For the serious among you take this as a cautionary tale about leaving kids unsupervised. For the not so serious they never actually ate breakfast…hmmm? This film made me think that I definitely wanted Saturday detention when I got to high school. It's easy to forget how much emotional baggage we carry as teenagers. Watching a film like this every now and again helps put you back in that place and hopefully understand that some of the things about teenagers that we find trite and silly are really significant markers in their lives. A good escape and I am pretty sure it is a true story. 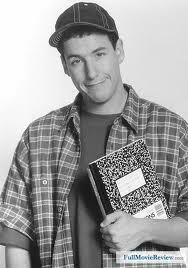 Sandler movies are well Sandler movies but perhaps no other film collapses the process of education so well(really?). Chris Farley does his thing and too many one liners to recount. There is for me no greater line in filmaking than when during the academic decathalon the following is spoken by the judge. As a tennis coach and fan, Bridgette Wilson gives me yet another reason to appreciate Pete Sampras. I know it's from a different film, but I'm so glad that Sandler refers to the Medulla Oblongata in The Waterboy. My psych students remember it so much better because of it. As silly as the film is, watching a grown person invade the life of school kids at least makes you think about the reason and purpose of education in the first place. I just sat through a professional development lecture from a lawyer on teacher and school liability issues. Overall, it was an informative and helpful experience. It raised several questions often missed in the public discussion of education. Primarily, when is a teacher not a teacher? The issues discussed in this ninety-minute session were vital to the integrity of the teaching profession and the mental, emotional, and physical growth of our students. None of it addressed student learning or achievement. The primary focus of the talk centered on expectations and liability in the teaching profession. Being a lawyer, the speaker’s point of view represented a “better safe than sued mentality.” The speaker strongly encouraged teachers to avoid “friending” students on Facebook and talked about how our personal and professional lives should maintain a clear boundary. I don’t accept students as friends on social media sites, but I did think about the teachers’ role in the larger community. As I age into my profession, I am teaching students who have become real friends through connections we’ve made while living in this community. I’ve taught two of my nieces and a third is currently a student at my school. My children’s friends, who’ve been to my home and who’s parents I consider my own friends will soon enter my school. I may find my own children in my classroom in the near future. Increasingly, I have students sitting in my classroom who I’ve watched grow up. I’ve gone to church with them, lived in the same neighborhood with them, cheered for their sports teams, and more. These connections remind me of how much responsibility I have both in school and out to the youth of my community and nation. A lawyer will recommend that we keep a clear boundary between our personal and professional lives, but the reality is that with time, a teacher who remains in the classroom and grounded in their community can’t maintain such a clear boundary and continue to be an effective teacher no matter how hard they try. This means that if they continue in the profession they must maintain a personal life that is beyond reproach. It is a tremendous burden. Most great burdens result in triumph or tragedy… and sometimes both. In case you missed it, The Daily Show with Jon Stewart hosted education Secretary Arne Duncan last night. No time to comment this morning, but Valerie Strauss at the Answer Sheet has a few words about the appearance. We've embedded the video here for your viewing pleasure. 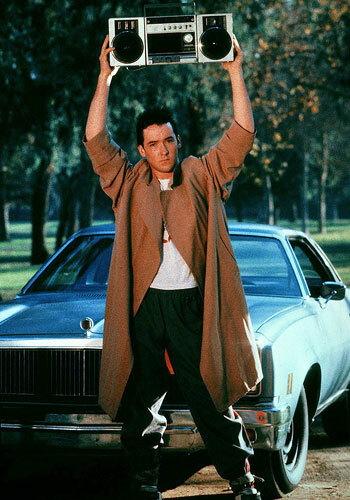 Lloyd Dobler would say something. If you don't, someone will. This truism could be applied to countless scenarios but fits well the field of public education. Fact is that there are plenty of folks out there saying stuff about education. The media, politicians, reform leader profiteers, philanthropists are all weighing in. Most of their ideas do not originate or even consider input from teachers. Some of these folks are more celebrity than educator. While some know what they are talking about, there is no shortage of poorly informed ideas. Teachers are fond of keeping their views within our classroom walls though on occasion we pass along articles to each other originating from those that are critical of those within our profession. Some of that criticism fuels our fire to improve. What teachers and public schools face in today's climate though is a different animal entirely. Getting down to brass tacks there are those out there doing and saying things harmful to teachers and teaching and it is incumbent upon teachers(and others) to speak up. Like just about everyone else out there teachers tend to think they work really hard. Avoiding this debate, what is agreed upon is that the teaching profession is a tough one that has a habit of wearing people down. Lots of good talented people quit. Not all teachers are saints. But they are not robots either. No great teacher goes through lessons in a mechanical manner detached from their surroundings. The simple act of teaching involves giving. Most people can only give so much. Famous for what some call "whining", teachers might deserve some criticism for our self-pity. But it is out of necessity in an effort to find support among shared hardship. It is also true that unless you teach, you just cannot understand all the job involves. Those who did so for 3 years on their way to getting credentialed up to administration simply can no longer comprehend like those knee deep in a classroom. The camaraderie and awareness of what teachers need gets lost in translation, differing priorities and perspective. These differences are magnified when discussing the contrast between those trying to shape education and those working in it. The average teacher rarely engages directly in policy making, choosing instead to dutifully labor in the calling they love. This may no longer be possible given the assault on the profession. Ill informed individuals along with powerful and self interested groups have set sights on remaking the "school" dynamic in a way more beneficial to business and their own ideological principles. The battle front for this has been the media and in the legislature. Nationally, at the state level and locally much is being done to undermine faith and support in one of our most significant public institutions, the public school system. He is a "General" after all. The voices rising against pubic education often cite international comparisons, test data and carefully select facts to convince scores of people that in fact little is being done right. They can be convincing, especially without response. Unions and other education advocates have proven unable to match their volume or effectiveness or have abdicated their responsibility to maintain their influence. They instead end up as targets themselves and are named as among the chief problems with the system. There are causes for concern. But we are leaving the enumeration and resolution of those to people far from the schoolhouse door. Its analogous to entrusting military policy in the Middle East to an arms manufacturer or maybe the Surgeon General. Or a large school system to a magazine publisher...nevermind. The future for our schools is far from certain. What is clear is that if substantive and effective changes are to occur teachers must speak up. Their views and experiences must be the bedrock of the future. As virtuous as any voices may seem if they are not formed with the thoughts of the simple teacher in mind, they are flawed. Until such time as this occurs it is only natural that things head in the wrong direction. The course will be guided solely by carefully selected data or knee jerks. Teachers must be advocates for their students and schools on a broader stage. They must educate themselves and voice their views at a level equal to that of the philanthropist billionaires, well connected lobbyist, high minded edupreneurs and opportunistic politician if policy is to be well informed and beneficial. The debate needs balance, reason and common sense injected. So get informed. Take action. Speak up. Now is the time for all good teachers to come to the aid of education. If they do not, a disproportionate degree of influence will remain in the hands of the privileged connected few who lack expertise and perspective to really know what is good and what only sounds like it. Hey Virginia Teachers-- Great Job! Growth Model evaluations, loss of continuing contracts, budgetary woes getting you down? Never fear teachers of Virginia, the Teaching Underground is ready to give you a pat on the back. You’re doing great! Keep up the good work and don’t let the political rhetoric and imposter reform movement ruin your day. Here’s a short list of Virginia's achievements in the past year. This year, Virginia powers back to the top spot with the best overall score in the history of our study — 1,660 out of 2,500 points. Texas slips back to number two with a respectable 1,578 points. In Education, Virginia jumps seven points to rank sixth, reflecting an effort begun in 2009 to reduce class sizes. First of all, it’s nice to see that someone realizes that class size matters, but it’s also nice to see an acknowledgement that in Virginia, education isn’t to blame for our shortcomings. What is you ask? Not all is rosy in Virginia. The state fell eight spots to number 26 in Quality of Life, which, among other things, measures healthcare. The number of uninsured residents in Virginia has risen steadily in recent years. What else are we getting right in our Virginia schools? Oh, yes, Education Week rated Virginia schools fourth overall in the nation this year. Across five categories, Virginia scored an overall grade of 82.6 compared to the national average of 76.5. Guess what categories reflect the most room for growth. So Virginia ranks third in the College Board’s ranking of the percentage of graduates scoring a three or higher on AP exams, positioning themselves to earn college credit in high school. We hear a lot of talk nationally about the importance of STEM, so Virginia schools' performance in the area of Science education is important. According to the Science and Engineering Readiness index-- developed by Susan Wite from the Statistical Research Center at the American Institute of Physics and physicist Paul Cottle of Florida State University-- Virginia ranks 6th with a score of 3.73, above average. The SERI score is a scale of 1 to 5 reflecting how well states perform and allow opportunities for success in physics and math education and teacher qualifications. According to The Fordham Institute report, The State of State Science Standards 2012, Virginia is one of only five states scoring a grade of A- or better. Virginia didn’t do well on one ranking system. 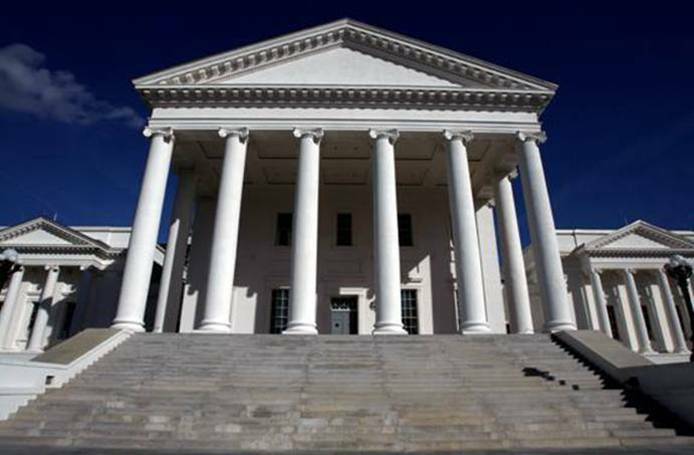 The American Legislative Exchange Council (ALEC)—which heavily influences the legislative agenda in Virginia— ranks Virginia schools 26th, by using the sole measurement of NAEP test results for low income fourth and eight graders. Worse, they give Virginia a grade of C- because of Education Policy in the areas of Standards, Charter Schools, Home School regulations, Private School Choice Programs, Teacher Quality and Policies, and Virtual Schooling. This report is supposed to provide a road map for legislators to follow to bring about educational excellence in their state. Based on Governor McDonnell’s education proposals for 2012 it would appear that Virginia is following that road map. So instead of recognizing the quality of public education in Virginia by congratulating teachers, principals, and superintendents on a job well done, we get empty words of gratitude and a policy plan that reflects the empty assumption that Virginia schools are failing. It may not be worth much, but to the public educators of Virginia, The Teaching Underground says, "Keep up the good work. You've achieved much and we're sure you know that as educators we always seek improvement. Be proud of your efforts, continue to appreciate your students, their families, and communities, and despite policy-makers and pundits who seem bent on proving differently-- Know that your hard work, expertise, and experience makes a positive difference to the Commonwealth." Stop reading. That's it, really. I know that statements like that always have a "but" following that essentially negates every positive comment. Not here. Good job. Knuckle Bump. That's the end of the story. You may be aware that in December the TU took a trip to attend the National Council of Social Studies Conference in DC. One thing we looked forward to was hearing directly from Secretary of Education Arne Duncan. Perhaps even having the opportunity for him to hear from us. That did not happen. TU thinks he ducked the teachers but the official version is that he was "called to the White House." Seems other teachers and education advocates had similar experiences. So we are left to ponder if leaders know what they are supporting. Haunted by a Geoffrey Canada statement "there is no plan". The following video was created by two teachers frustrated by current efforts by reformers like Duncan and even calling for a replacement. It lacks a catchy hook and the beat leaves much to be desired. 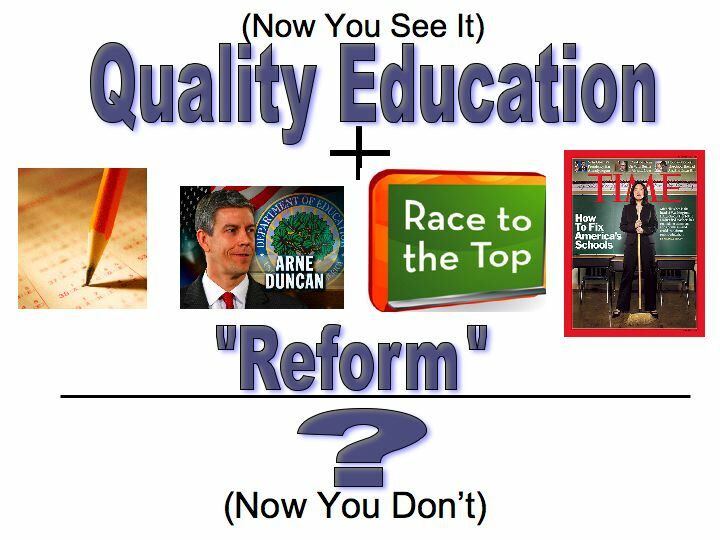 What it does have is the ability to sum up how many educators feel about the Secretary of Education Arne Duncan and overall current trends in Education Reform. Problems sure, but an "education crisis"? One of TU's previous posts proposed that the popularly held feeling about our schools is inaccurate. Ask just about anyone out there about how we are doing and there is a startling degree of uniformity from the majority of respondents. "Failing". What this says is that those preaching the message of gloom and doom surrounding our nation's schools have been amazingly successful. The rub is that while there is need for change, the idea that schools are all in crisis is simply not true. The catalyst for the message rose partly from the chronic gaps in performance between American schools and foreign schools on international tests. Beginning several decades ago it gained more momentum when among other issues, concerns over performance among racial and economic groups drew more attention. 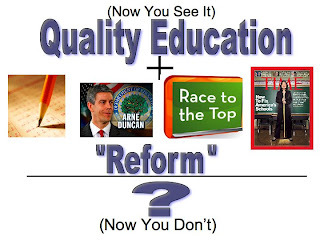 Goals 2000, No Child Left Behind and now Race to the Top seemed designed to provide evidence of failure. This was leveraged into a frantic call for dramatic reform. It could be argued some schools and some kids are in a state of crisis. More accurately some communities are in crisis and schools reflect that. But a national crisis involving all our schools? Who stands to benefit from such a conclusion? Many argue that it is the children in our schools. Possibly true, but opinions differ greatly on this. 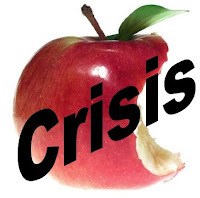 To date, a call to action and the reforms generated by this "crisis" have failed to effectively remedy the ills so often mentioned as the cause of our failure. The merits of reform generate a great deal of impassioned argument. Their implementation has unarguably generated a powerful response among teachers. The response from those at ground level so far lacks a visible leader(Diane Ravitch is one exception) or influential outlet equal to that of reformers. This causes the teacher voice to lack clarity and platform causing any concerns they do express to be ignored or to go unheeded. In the hands of the failure reformers, what is heard from teachers is interpreted by the public as "all the things that teachers and unions oppose"and played as support for the status quo. That turns many people off to teacher concerns, even if they are valid. What teacher is opposed to what is good for kids? None worth their salt. Schools and teachers constantly strive to do better, always have. The questions remains what path is best to bring this about. Despite the uncertainty and opposition, the movement toward rapid and sweeping change gains momentum. What the source of this momentum? Or should we again ask who is source? Reformers, that's who. Individuals like Gates, Duncan, Rhee, Bloomberg come to mind. 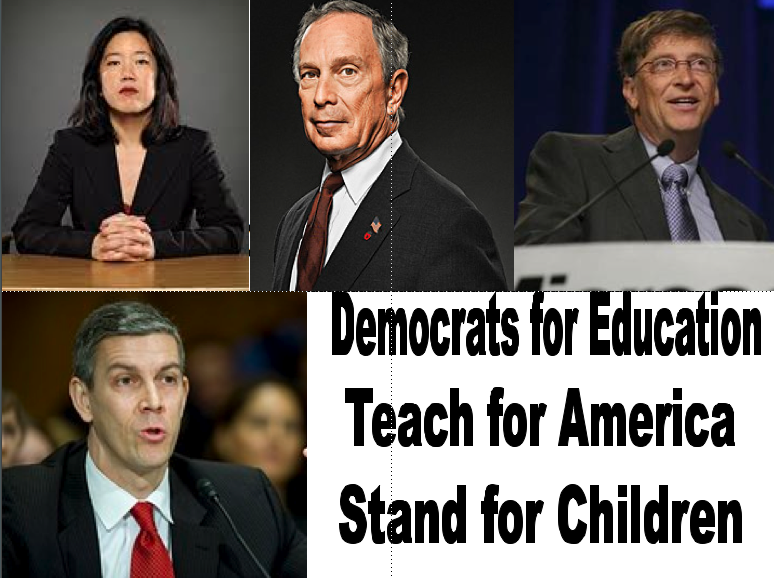 Democrats for Education, Stand for Children, Teach for America along with innumerable foundations with varied missions all share the mantra of crisis. One group less visible to those not in schools that stands to benefit from a failing schools assumption is for profit education. Whether it be a testing company, edupreneur, software firm, education management group or a large corporate style foundation, many have staked a claim to public funding and are working hard to steer it where they want. They are advancing their cause by spreading the crisis message. There is no shortage of talkers seeking and conferences out there putting the failure message front and center. Large sums are being spent on advertising or lobbying of politicians who have all too easily bought into the rhetoric of failing schools in order to leverage their own political gain. So they too feed the crisis beast. Supporters of this corporate privatization approach contend private groups can do a better job. Opponents might point out they also tend to cost more in the long run and siphon funds away from students. In the process untold damage is being done to a vital institution. Ultimately what matters is results. Testing is the core of what's used for comparison by reformers and much is left in terms of rating their true value. Most teachers express doubt as their validity and how scores are being used. What will be the result of such a major shift in education? The result of this approach to education is potentially harmful. Informed voices of reason are overshadowed by the call to fix the perceived failure. In a society that demands success the public expects measurable results and buys into this crisis mentality accepting more radical measures. The blanket thrown over the public schools labeling them as failing is one from which they cannot escape on their own. They will need the public's help to stem the tide of education "de"-form. That would be a challenge with the national crisis mentality. This path prevents focus and identification of issues that could be resolved independently and successfully. Beneficial changes have occurred but you have to search for them. In sum the smothering perception of failure has more done damage than good to schools and the people in them. At the bottom of the education chain, in the local community and classroom, it has created to more problems than it has solved. That's where any change worth its salt must originate, in the school. Such innovations today are hard to come by with all the reform mandates. So this perceived crisis has led us to the brink of a real crisis. Much is currently being done wrong. Testing, privatization, top down corporate style reform is replacing much of the identity that was the strength of the community public schools. Change and improvement are welcome if beneficial but there is little inclusive dialogue on how to go about this. True education reform is nothing new and nothing to fear. What would John Dewey think of where we are headed? Have we have allowed certain groups and influential individuals to convince the American public we are failing so that any and all change is deemed as good. One prime example would be the celebration of school closures? How can anyone hold that up as a success? The deep divide among those in the school and those who seek to control them is evident in such a scenario. Testing scandals and debate about actual turnaround results of key reformers like Klein and Rhee are evidence the issues are far from settled. Not working directly in education it is difficult to grasp the scope and scale of the issues involved. Reformers at the top believe they understand them. Using public ignorance as a tool, reformers have essentially been given the keys to the kingdom. Emboldened by this authority they roll out increasingly drastic and irreversible ideas. More and more monocracies are tolerated. They decided schools were failing. They launch more efforts to convince others of this fact. They used this environment to assume even more control, a dangerous amount in many cases. They've done little to include educators in the reform process and have created a polemical landscape rife with accusations and even fear. Those promoting the failing mentality have become opportunists and seek sources of public funding. Diverting public monies to their latest effort with seemingly little accountability. Sounds familiar doesn't it? Their high profiles in many cases have set them up for lucrative positions when they jump ship, leaving others to clean up the mess and do the heavy lifting. The darlings of private foundations they set to work weakening aspects of the teaching profession so they opening the door for their ideas unopposed. They work hard to influence Congress and state legislatures that their ideas warrant support thereby completing the cycle. Outcome based measures of quality have become misguided, vague, ill defined and subject to manipulation. If this acceptance of unproven and unwise change continues to be tolerated what will be left? The simplicity of a national "crisis" approach is appealing. It taps into the belief that educating our kids is among our most important tasks. How we choose to go about doing that is increasingly becoming narrowly focused, controlled, defined and implemented. If we fail even a single student it is indeed a terrible thing. But that does not equate failure for the school and certainly not systemic nationwide failure. Schools accomplish much that cannot be measured. Are we constructing a system that seeks to "educate" kids but falls short of things that will truly help them better themselves? With the current trends are we really able to prepare them to function as citizens and serve the greater good? We are creating a system built around failure. Continuing to do so will only create more problems that need to be solved. Depending on the measures used you may or may not think we are in crisis. What is certain is that a growing belief in that fact threatens to leave an actual crisis in its wake. Then again maybe that was the point of those creating this crisis? Don't read too much into this. It's obviously meant to be funny. As we enjoy an occasional laugh at their expense we must be able to laugh at ourselves. We keep in mind how much we love our jobs and the opportunity to work with our students. Oh and we too have been known to say the darndest things. On today's Ellen show, teacher Sara Ferguson of the Chester Upland School district in Pennsylvania appeared as a guest. Everyone in America should know this story. It is not just a sad story about deficiencies in school funding. It is a story that provides an excellent contrast to the common perception of teachers in America today. These teachers continued to work and serve this community EVEN WHEN THE MONEY RAN OUT! If you weren't able to see the show, here's the five-minute clip of her appearance.